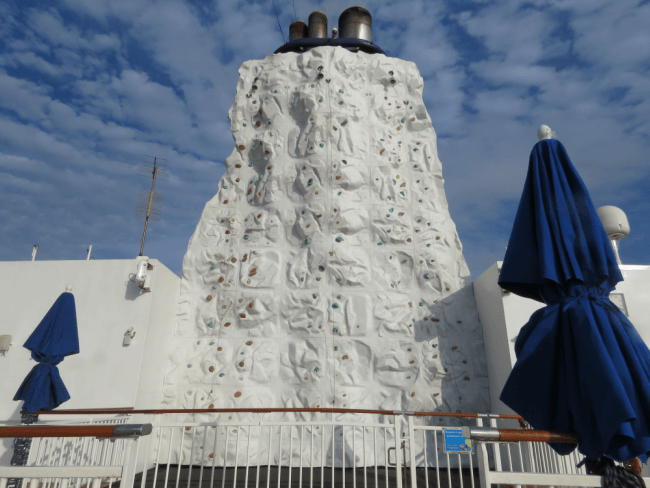 If you are planning a cruise from the United States, then the Norwegian Pearl will likely be an option. Currently, it sails out of New Orleans. Soon, it will cross the Panama Canal on its way to Seattle. During the summer, the Pearl will transport passengers to Alaska. Afterwards, a California Coast and a return Panama Canal cruise takes the ship from Seattle to Tampa. Next winter, It will cruise the Caribbean from there. I just returned from a 5 day Western Caribbean cruise aboard the Norwegian Pearl. 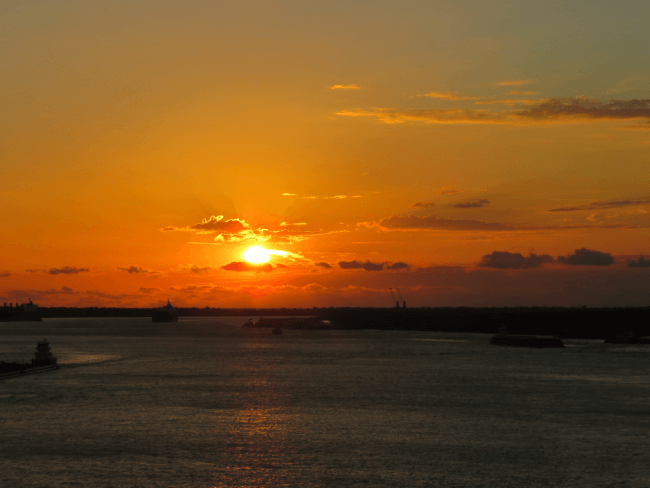 Sailing from New Orleans, we headed to Cozumel and Costa Maya, Mexico. This was my first sailing with Norwegian Cruise Line. I was excited, but really did not know what to expect. So, how was it? Read on to see. 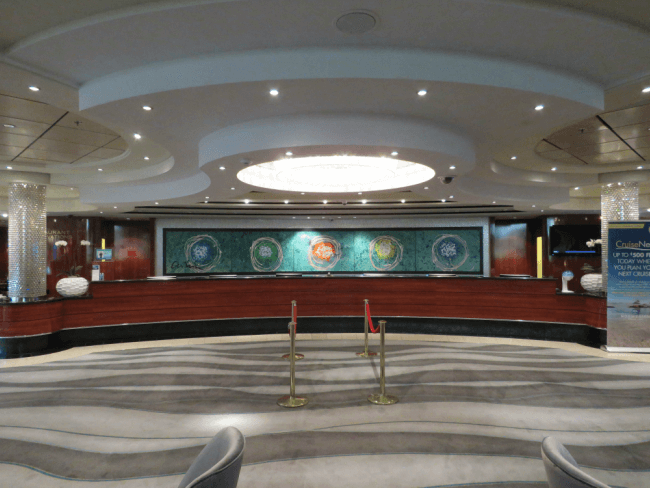 Norwegian Cruise Line allows passengers to choose a check-in time. I opted for an early time. By checking in early, I would be one of the first to board the ship. Norwegian asserts that this keeps lines and waits to a minimum. I found this to be partly true. The check-in took almost no time. It was smooth and effortless. After checking in, I was guided to a large waiting room. Here, I grabbed a seat and waited, and waited. The gap between my check-in and embarcation was about 90 minutes. I had a seat, water, restroom, and reading material. As time passed, all the seats filled and the room became very crowded. Passengers with later check-in times did have to stand in line longer and then were greeted to more standing in the waiting room. Overall, my total wait was longer, but more comfortable. I was among the first to board the ship. The ship was virtually empty. 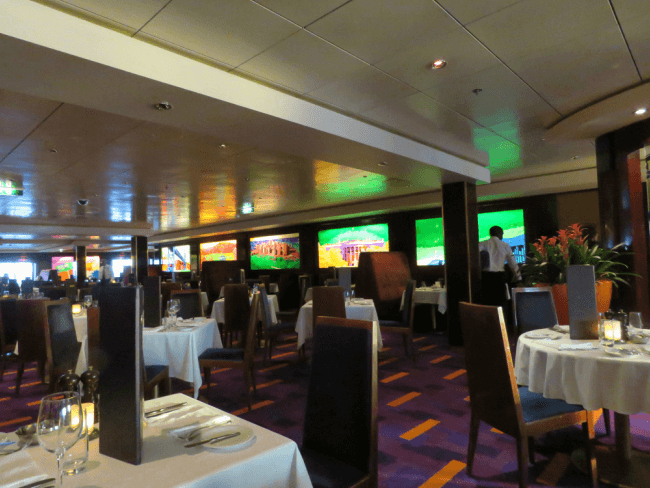 I had no wait for dining and was able to explore the ship freely. The Norwegian Pearl is nice. While this may not be a glowing endorsement, it is not a criticism, either. You will not find fine chandeliers, marble floors, and grand staircases, but tastefully decorated, less assuming public spaces. I particularly like the art displayed throughout the ship on stairwells and walls. The Crystal Atrium, as the main lobby is called, makes for a comfortable, even cozy central meeting space. Movies, quizzes, dance classes, cooking demonstrations, even paper airplane contests take place here. While not fancy, it certainly serves its many functions well. 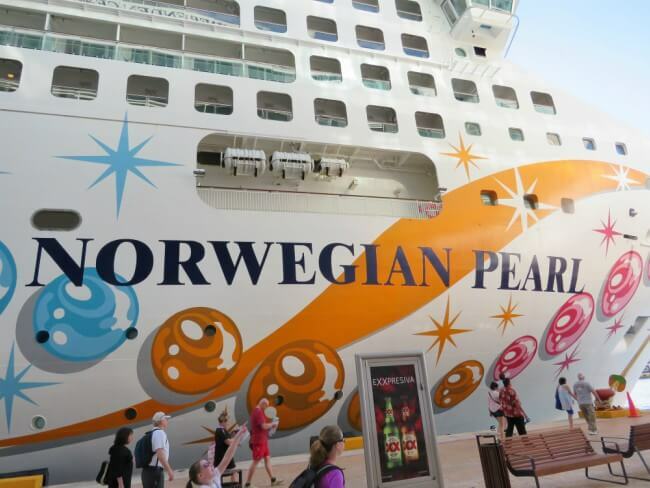 The Norwegian Pearl carries approximately 2400 passengers. The lay out is logical. It is easy to find your way around. Some people complained about having to descend half a flight of stairs to enter the main dining hall, The Palace Garden. Standard staterooms aboard the Norwegian Pearl are quite small. While I feel that the rooms would be very tight for more than two people, I spoke with many repeat NCL cruisers who were perfectly pleased even with families of four. 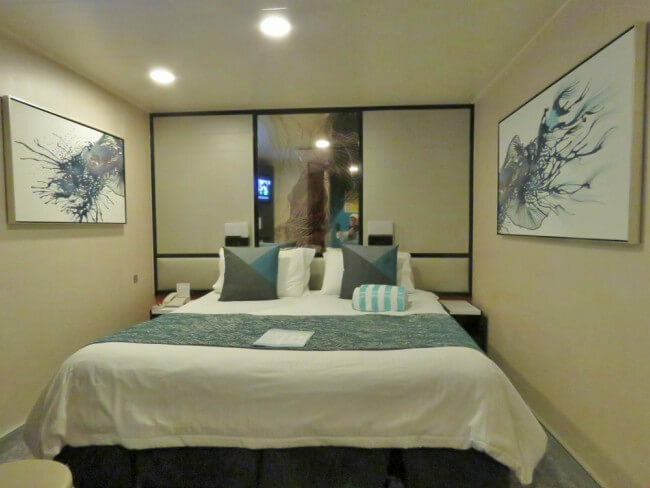 The rooms are clean, comfortable and tastefully adorned. In my opinion, cruise staterooms serve the function as a place to sleep and bathe. My Norwegian Pearl room more than sufficed. Closet space was ample. A flat screen TV stretched out from the wall. Several plug-ins including one USB port made recharging cameras and an ipad easy. The bath was large enough. 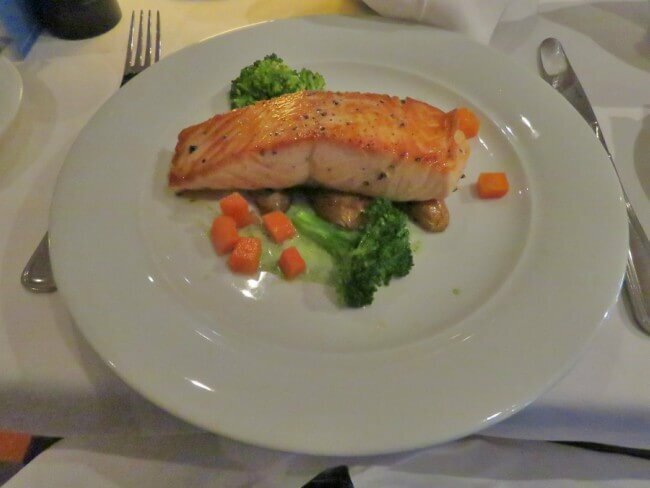 Norwegian boasts about “Freestyle Dining” – eat at any time, in whatever restaurant you wish. There are no stringent dress codes, either. 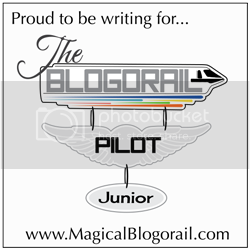 This is quite popular with passengers. The Summer Palace is the main dining hall. 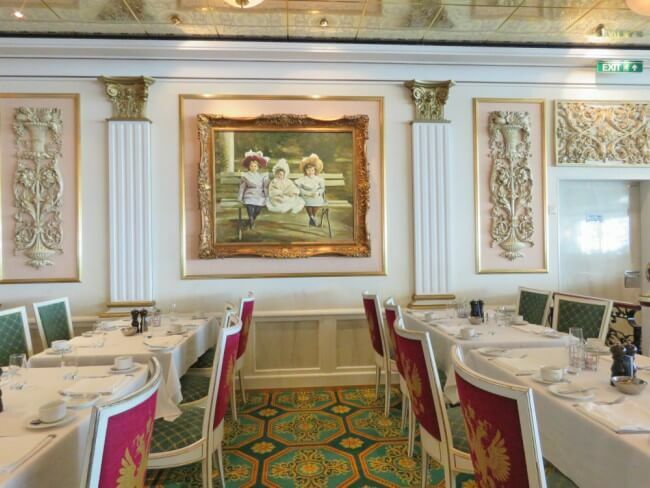 The decor takes you to St. Petersburg, Russia at the time of tsars. Classical music plays softly overhead. The atmosphere is calm and relaxed but elegant. Service was excellent. Food quality ranged from good to excellent. Part of the menu remains the same and part changes from night to night. There were plenty of options. Indigo is the smaller main dining hall. Pop art images of American landmarks adorn the walls. Pop music fittingly is played. The menu is exactly the same as the Summer Palace. The nights that Laveena was my server, the service was excellent. The one dinner that I had another server, the service was quite subpar. O’Sheehan’s serves pub grub. 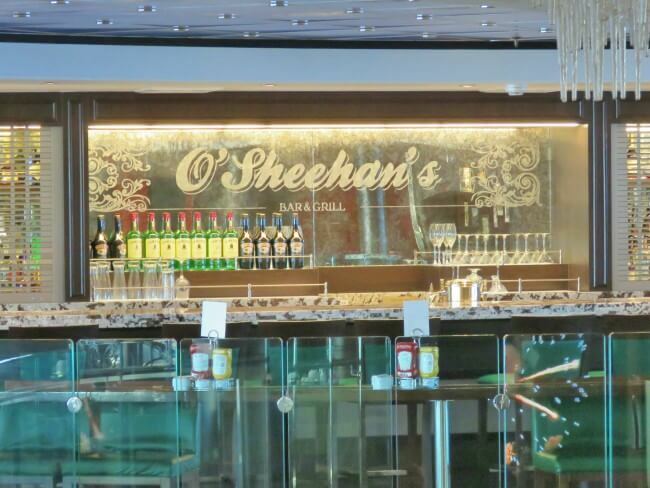 Each night, a specialty dish is served like prime rib or Irish stew. Otherwise, the menu remains the same. Seating surrounds the Crystal Atrium. You can either overlook the atrium or watch the sea with an exterior window. Sports plays on numerous televisions. I tried the shepherd’s pie. I had never had this before. It was very tasty. Service was prompt and courteous. Asian cuisine is served at Jade Garden. The decor is typical U.S. Asian eatery. Again, the service was excellent and the food was fresh and delicious. 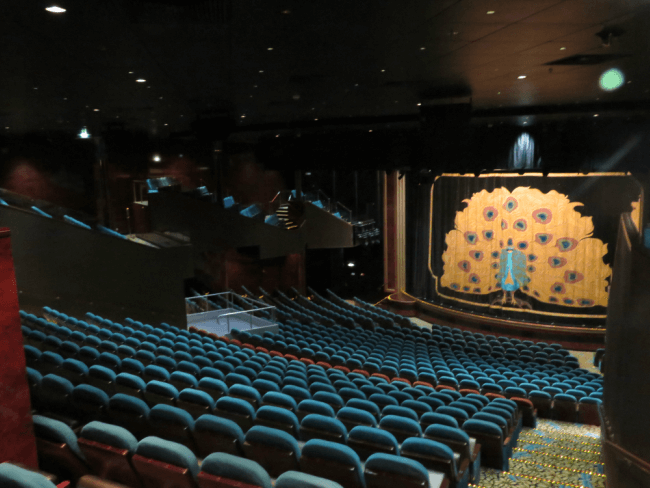 The Norwegian Pearl shines when it comes to entertainment. The options are diverse and numerous. Each night, a headline entertainer performs in the Stardust Theater. 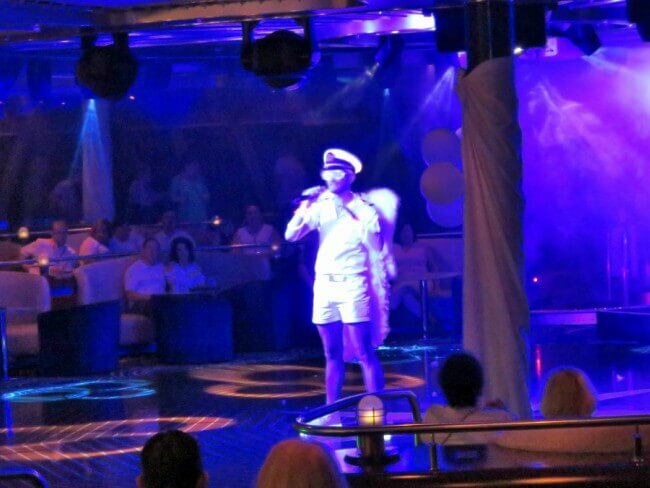 Original performances were given on the first and last nights of the cruise. Both were good, but not great. The exception was the Elvis impersonator in the “Legends of Rock.” This man took his performance seriously and was stellar. He wiped his sweaty neck with kerchiefs and handed them to women awaiting at the front of the stage. There was an Elvis fan club on board. Dozens of women lined up at the front of the stage. He gently bent over and kissed each one of the them! A magician, a comedian, and an a pair of acrobats performed on the other evenings. Each were highly entertaining. Comedian Eddie Clark had the crowd howling and crying. Nightly game shows presented by Vincent, the cruise director, were also a hit. “The Not So Newly Wed Game” was one of the funniest things that I have ever seen. A couple married 48 years and with no shame had us all rolling in the aisles. Vincent displayed a Johnny Carson like ability to milk the moment and let it grow. Games, contests, quizzes, dance lessons, Spanish lessons, cooking demonstrations, educational lectures, a library, a game room, an arcade, and more kept me and other passengers busy and engaged throughout. Lounges and bars really do not appeal to me. 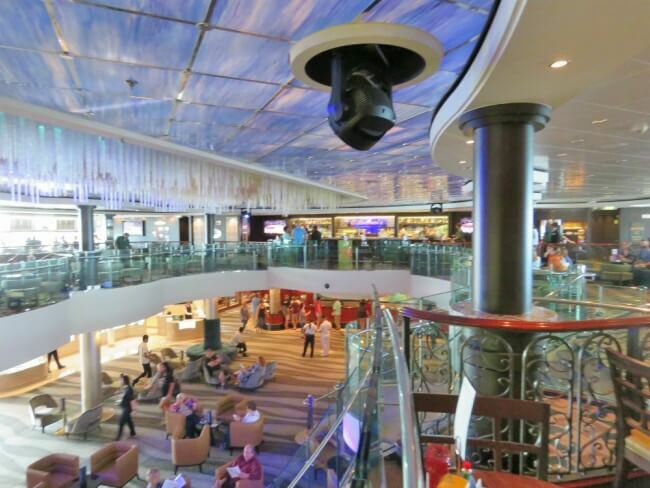 The Norwegian Pearl has many such spaces, including a casino. I did visit the Bliss Lounge and Spinnakers, though. Bliss Lounge hosts bowling and karaoke. Four bowling lanes can be reserved. I only saw people bowling once, though. The furnishings are quite unique. Purple, velvet daybeds occupy corners and a private room. On my cruise, the Bliss Lounge was little used. Spinnakers hosted the evening game show and dance party nightly. At least two of the dance classes were given here. A semi-circle of tables and seats surrounds a stage and dance floor. It made for a great venue. Service can make or break a cruise. 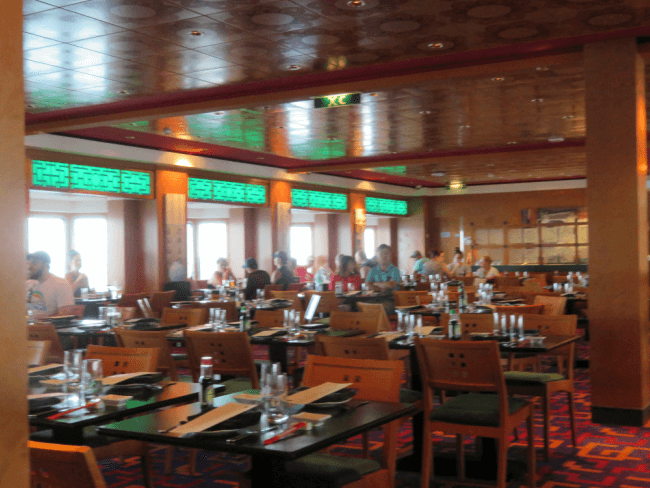 Most of the service on the Norwegian Pearl was excellent. I returned to Indigo for dinner on all but one evening because of my server, Laveena. She was exceptional. Each night, I would request her by name. The one night that I did not have her, though, my service stunk. Our dinner drug on slowly. Our server never returned to ask us about dessert. We ended up leaving. Two other exceptions stand out also. My one encounter with the help desk found it to be neither helpful nor particularly friendly. The other was the greeter at The Summer Palace for lunch upon embarcation. Even though the restaurant was open, he fervently did all that he could to dissuade me and others from dining there. Norwegian Cruise Lines allows you to book your shore excursion online prior to the cruise. I chose to do this. It went without a problem. Tickets were delivered to my room on the first night. I did not have to wait in line and waste precious cruise time booking while on board. The NCL website and blog reviews helped me choose. I had a wonderful time and the prices were reasonable. 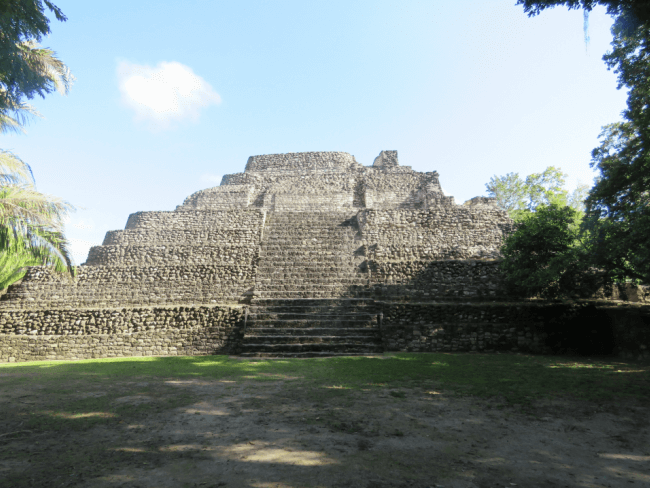 Ample time was given to explore the ports, Cozumel and Costa Maya; 10 and 8 hours respectively. Reviews of the shore excursions are upcoming. Cruising on the Norwegian Pearl is a great value. 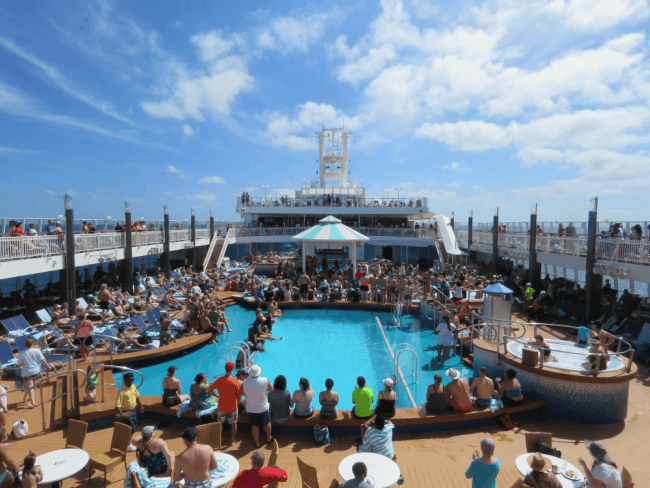 You enjoy countless entertainment options, good service, and good food in a clean and comfortable environment while visiting beautiful ports. All of this comes at a very reasonable price. You will have a good time. My only complaint comes as a non-smoker. The smell of smoke was ever present in outdoor areas. 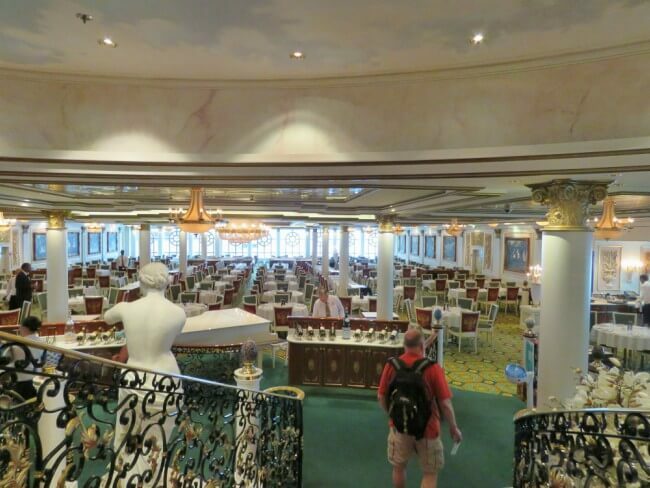 The entire promenade deck, encircling the ship, was an open smoking area. Half of the pool area and the sundeck was smoking, half non-smoking. The smell caused me to avoid these areas. The smell of smoke also intruded into the Stardust theater during the evening headline shows. The Stardust is on deck 6 with the casino. This was more egregious. I know that this is a contentious subject. It did decrease my enjoyment, though. 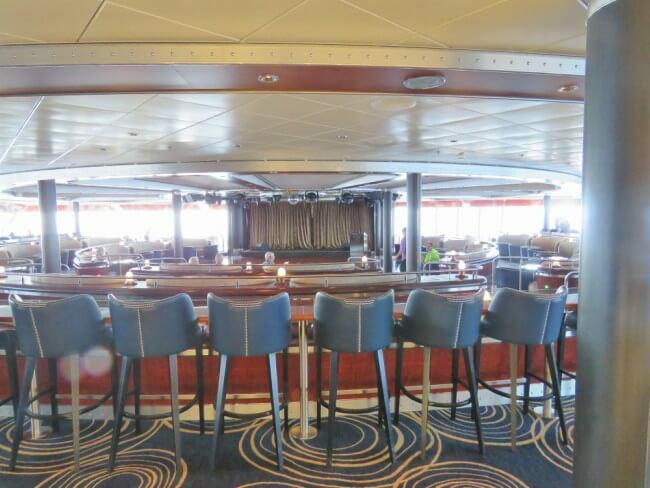 Norwegian Cruise Line’s “Freestyle Cruising” makes for a relaxed, fun environment. Adults wanting an affordable, casual, cruise vacation will love the Norwegian Pearl, unless they have a severe aversion to cigarette smoke. Adults who desire a more upscale and formal experience will not find it here. The Norwegian Pearl has programs for children and teens, but does not specifically cater to them. If your child enjoys doing what you do on a cruise, then they will have a great time. If they want or expect constant programs like on Carnival or Disney, then they might be disappointed. The value of the Norwegian Pearl cannot be beat. Most cruisers will have an amazing time at a great price. It’s a beautiful boat and sounds like you had a wonderful time. I did have a great time and recommend it.